The Chronicle Tuhfat al-Nafis (“Precious gift”) is one of the most significant sources for the history of Johor, which is a very important independent Muslim state in the Malay Archipelago from the 17 to 19 centuries. Tuhfat al-Nafis is written in the Malay Ianguage, with the Jawi script and sheds light on many aspects of Malay-Indonesian history. It reflects the main ideological and cultural principle of Malay-Indonesian society – unity in diversity. 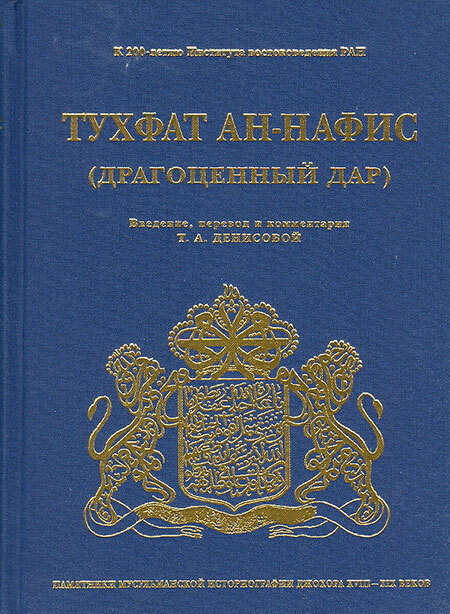 This book is the first scientific publication of the text of Tuhfat al-Nafis in the Russian language. This translation is based on the text of the so-called “long” chronicles of Tuhfat al-Nafis, written in 1866 by Raja Ali Haji (1809 – 1872). In the understanding of the Islamic concept of history and historiography as well as in the interpretation of many important aspects of the history of Islam in the Malay world, the author follows the ideas of Professor S.M. Naquib al-Attas, a distinguished contemporary Malay Muslim philosopher and the author of many fundamental books on Islam, Muslim philosophy, and historiography. The book consists of Introduction, Translation into Russian language, Comments, Abbreviations, Name Index and Index of Geographical Names, Bibliography (more than 120 works in different languages), and Summary. The Introduction begins with a general overview of the history of Johor from the 17 to 19 centuries. It continues with the brief historiographical review of available Western and Eastern sources regarding this period of the Malay history. It also contains the description of manuscripts of Tuhfat al-Nafis, the data regarding the previous publications of the chronicle, as well as the information about the author and other Malay Muslim intellectuals of that time. In addition to that, the author represented Tuhfat al-Nafis as a masterpiece of the Bugis historiography of Johor and emphasized its special characteristics. The Chronicle represents extensive information about the rulers and dynastic marriages, the customs and rituals, about the battles and pirates, navigation and trade, about the flourishing and decline of the states. One can also find in it didactic reasoning about how to be a just ruler and a worthy citizen. In his brilliant work the author reflected the major philosophical and religious views of that time, such as concept of monotheism and posthumous retribution, notions of justice and morality, history and science. The translation is provided with footnotes and extensive comments including references to the textual disperancies and inconsistencies from different editions of the text. Comments contain historical and historiographical data, the information about significant personalities, toponyms (place names) and their location, various types of ships, weapon, jewelry, goods, and other terms related to the local culture and customs. Special attention is paid to the interpretation of the important Islamic definitions and realities. Tuhfat al-Nafis is the most complex and sophisticated indigenous Malay history composed before the 20th century. The present publication introduces this very significant historical source to the Russian intellectual society and will help to understand better many aspects of the Malay Muslim history and culture. The work is devoted to the memory of Prof. E.A. Davidovich. The present study offers a lot of new data and interesting perspectives for specialists from various areas of expertise, be they history, economics, social science and others. The book is also useful to a wide range of readers who are interested in history, culture, and economics of the Malay World and South East Asia as a whole.